Here's Gabe manning the CD stand while modelling the new suit ( thanks to Macy's!!) which we debuted this evening. One of the fun things about touring in Europe is how each country's audiences have their own particularities. 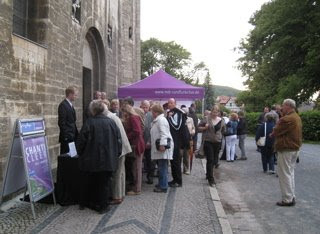 Chanticleer has probably toured more in Germany and for longer than any other European country, and there's a long and deep history of choral music here - so we feel very much at home. The German audiences don't give it up until the end, but then they really do! We did an extra encore: Mr. Biebl's Ave Maria.